The statement “great wines start in the vineyard” has become almost trite, but is a truism to which we absolutely subscribe. The fact is that if the grapes are not right, there is only so much that even the most talented winemaker can do to rectify the situation. In contrast, quality grapes are more forgiving of mistakes and open a full range of possibilities to the winemaker. At Shaker Ridge, we do a certain amount of home winemaking ourselves, and so have learned these lessons the hard way! Anyone familiar with wine grape farming knows that it is highly labor-intensive, and at our family farm we do much of the work ourselves. However, we make use of crews to complete operations that need to be completed in a tighter time window than we could physically accomplish ourselves. The fact that farming on a small scale is not highly profitable is not a secret, at least to those who do it. Given these facts, it follows that we would be crazy to devote so much time and effort to produce only mediocre grapes. Rather, we are striving to produce the best quality wine grapes possible, in the hopes that our grapes will be sought after for award-winning, memorable wines. Our viticultural practices include minimizing the use of herbicides, drip irrigation to conserve and control water usage, and hand harvesting and sorting of grapes. 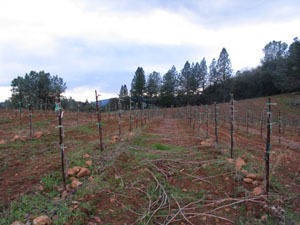 While not organic growers, we do try to follow the Code of Sustainable Winegrowing Practices. The vines in our main vineyard are head-trained to naturally moderate yield. Most importantly, we aggressively shoot thin and “drop fruit” during the growing season to increase sun and air exposure and control fruit load, all in an effort to promote full ripening of flavorful grapes.